…you’ll be very well looked after. 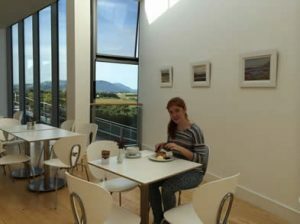 Its light airy seating area offers a bird’s-eye view to Achill Island, the majestic Nephin Beg Mountains and the magical wild Atlantic coast. An exceedingly warm welcome awaits you at this family run café making it a most enjoyable and enlightening place to stop. And then last, but by no means least, the food, which is all homemade using locally-sourced produce and quality ingredients. 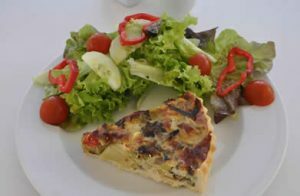 The fare is simple and fresh – teas, coffees, fruit Juices, vegetable soups, paninis, quiches, salads, scones, cakes etc – all delicious tasty goodies made by Jean-Pierre. The icing on the cake is the contemporary art that adorns the café walls – exhibitions change continually and all work is for sale. Have a look at our gallery website www.stronachgallery.com and see what we have on display. 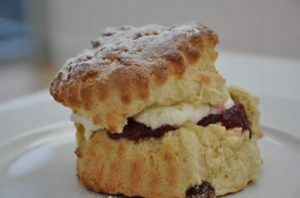 There is seating for 40 people and so we can cater for everyone from individual travellers to full coach parties. If you are a coach party and planning a lunch stop, it would be nice if you could let us know in advance. The café is a Free WiFi spot.